If you have a young child who is dealing with a loss of any kind Rabbityness is the perfect picture book. It acknowledges loss in a way that a child can understand although it doesn’t specifically explain where the main character, Rabbit, has gone. The Story: Rabbit does lots of rabbity things like hopping and burrowing but he also likes unrabbity things like music and art which bring joy and colour to the woods. One day Rabbit disappears and the other rabbits are very sad. Rabbit leaves a deep dark hole but at the bottom of the hole his friends find that he has left them some gifts. Slowly the other rabbits start to do unrabbitty things which makes them happy when they remember Rabbit and then they enjoy bringing colour and joy to the woods. Through very little text this book celebrates uniqueness and creativity before dealing with the subject of loss. It is unclear whether Rabbit has died or gone away so the story can be used for various situations. As expats we often have to say goodbye to friends who are moving away, this makes us sad as we don’t know if we will see some of them again. Rabbityness has helped us in this situation and my daughter understands that it is ok to be sad that our friends aren’t here any more but we can still enjoy the experiences that we have shared with them. 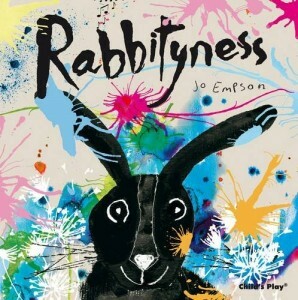 In Rabbityness Jo Empson’s illustrations use of colour represents different emotions. The white space and muted greens that are used when Rabbit is doing rabbity things are replaced by wonderful splashes of colour when he is painting, making music and enjoying himself. This colour also explodes on the page when he is spreading his happiness to the other rabbits in the woods. Then, very suddenly, the colour is gone and everything is grey and black. At the bottom of the dark, black hole the gifts are colourful and gradually the colour comes back to the pictures as the other rabbits start do unrabbity things and remember their friend. I was amazed by the impact this powerful use of colour had on me, for me the change from colour to grey was symbolic of a sudden death. My daughter’s current interpretation of the story is that Rabbit has gone away, she just wants to know why he has left all of his things behind. The simple, easy to read text supports the illustrations in the story, it really is the colour in the pictures that evokes the rabbits’ emotions and actions. If you know a child who is trying to come to terms with loss Rabbityness is a great picture book to support them in a difficult situation. This seems like a great book to have on hand, and a great resource should kids experience loss – which almost all do on some level. Your descriptions of the use of color to portray feelings makes it that much more appealing. thanks! We’ve only dealt with the loss of friends moving away but it’s good to know that Rabbit is on our bookshelf should we ever need him. Catherine you have a knack for finding great reads for the little ones! I love the idea and premise of this book.. its so important and looks like well executed! Thanks for sharing this on KidLit Blog hop! First of all, I love the title! I love the concept behind the book and I love the use of colour to symbolize emotion. Sounds absolutely fantastic. Thanks so much for sharing in the Kid Lit Blog Hop. Pinning!! !